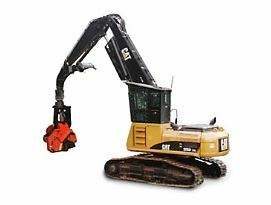 Cat Quality Undercarriage Forestry Machines - Kelly Tractor Co. When you purchased your Cat® forestry machine with genuine Cat Undercarriage, you made a smart investment. A significant portion of the owning and operating cost of your machine is undercarriage related. Following these simple tips will help you keep costs down. Minimizes track indexing due to packing. Undercarriage life is not typically limited due to wearing out. Structural failures are common as the machine sits in one location, used only for impacts/load shifting. If your machine is rocking back and forth, the bench is not adequately built. Keep boom and stick close when over side to minimize tilting/leaning. Minimize travel with machine leaning over side. Contact between shoe and shoe support wears away leading edge of shoe and can cause shoe crossing/breaking. Idlers first – for both wear and structural concerns. Do not travel with loads. If you can’t avoid a stump, approach it center of shoe (between bolts). Do not clip edge of stump with edge of shoe. If clear-cutting small trees over side, switch sides of machine frequently to share load from right track to left; do not swing cab 180 degrees. Free falling a couple of feet can send loads many times the machine’s weight into the undercarriage. Minimize length and height of ice lugs. Apply only to leading edge grousers – pattern of 2, 1, 2, 1, 2, 1 or staggered. Do not apply too far outside of track bolts. Special focus around carrier rollers (minimizes roller seizing) and between bushings (allows proper sprocket-to-bushing contact). Exercise the track for a few minutes each month so track joints do not seize up. At every track replacement, inspect shoe supports for excessive wear. Repair/ replace as necessary.